Partitions are ways of treating a single hard disk as if it were many. We'll look at why, how and when you might want to partition your hard drive. What is disk partitioning and how do I use it? Most folks actually never need to worry about disk partitioning. Your machine will have come pre-configured and that configuration is probably just fine for most uses. There are some times when it might make sense to revisit how your hard disk is used at the lowest level, and that's where partitioning comes in. Partitioning is, very simply, a way to take a single physical hard disk and make it look like more than one disk by dividing up the space. A great example is that many machines will come with a single hard disk divided into two partitions - one a very small one with "recovery" information on it, and another that represents the rest of the hard disk for day-to-day use. Sometimes the recovery partition is visible, other times not. "Partitioning is, very simply, a way to take a single physical hard disk and make it look like more than one disk by dividing up the space." You can see that my single 74.53 gigabyte hard drive is actually divided into three partitions: a tiny system configuration partition, a 2 gigabyte recovery partition which appears as drive D: on my machine, and then the balance of the drive as my drive C:. So drives C: and D: look like separate disk drives, but in fact they reside in separate regions of the same physical hard disk. There are several different uses for partitioning. As we've seen it's one way manufacturers keep a separate location for recovery files that are less likely to be damaged inadvertently by normal use by being on a separate logical drive. Multiple OS's Many multi-boot managers are really just giving you a choice of which partition to boot from. So you could, for example, put Linux on one partition and Windows on another, and then choose which you want to run each time you reboot. Both partitions may or may not be visible to both operating systems depending on how they're formatted and the capabilities of the OS's. Performance Because partitioning happens at the physical level many people believe that if done properly you can arrange the data on your hard drive more effectively through the use of partitions. For example some folks create a separate partition to hold the system swap file. Personally I'm not convinced that partitioning actually helps much for these purposes. Backup and Recovery Many more people often partition their hard drives so as to separate "system" from "data", creating a separate partition for each. This could allow you to, for example, restore your system partition from a back up without affecting your data. Similarly, it could allow you to regularly or more simply backup your data only. This tends to be a tad error prone as many programs still insist on storing things on the system drive, but it can at times be a useful way to organize things. Using Windows Disk Manager to create, delete, and modify partitions. In this case the partitions involved will be erased. All data thereon will be lost. Using a third party partition manager. There are several, and these tools will preserve the data on your partitions as you resize and otherwise adjust your system configuration. The real question is should you? In my opinion, unless you know enough to know exactly how it'll benefit you, you don't need to. And it's rare that partitioning actually buys you much more than simply keeping your hard disk organized using folders on a single partition. In fact, that's exactly how all my machines are configured: each hard disk is a single partition (unless, like my laptop, it came pre-configured some other way). Now, I know a lot of people will disagree and indicate that they had some significant performance gains and that they have some wonderful backup and recovery success stories that they can attribute to having partitioned properly. But for the average user it's just not worth a lot of consideration. Can I make my C: partition bigger by taking space from D:? Hard disks can be divided into multiple partitions, each showing up as a different drive. Changing the layout of partitions requires a few steps, and occasionally special tools. Why isn't there 80 gigabytes of free space on my empty 80 gigabyte drive? As it turns out, common terms used to measure disk space can be ambiguous. As a result, a megabyte to you might not be the same as a megabyte to your computer. ...Unless you're using Windows Vista, in which they've updated the disk manager to be able to resize partitions non-destructively. What I don't understand is I have a Drive E: / C: & D:. Then an apparently separate drive F: for DVD/CD ROM use. On the E: DRIVE, when I click on it to open any files it may contain, it says "This folder is empty"
However, when I check the properties, it shows that there is 373 MB of space used out of 1.05 GB of space on the drive. I don't understand what is using 373 MB space if the file shows empty? Is there a way of finding out what is being used that doesn't show up in the file? And if so, can I either partition it to free up the used 373MB's or will that erase everything on C: as well? With 1.5 TB disks (which I have external, but my comment applies to much smaller disks like 500 Gb also)partitioning makes all the sense in the world. With partitions for Programs, Data General, Multimedia Data, Projects it saves A LOT of time looking up things (instead of looking at one big 100 directory list). Defragging can be applied to the partition where needed most like your multimedia partition so files open faster, you also "loose" less time as you only defrag the partition you want to defrag at that moment. Big difference between defragging 1.5 TB or 250 Mb. I was wondering how to make a system reboot in another partition. Say like a 80 gig hard drive with 10 gig partaition for reboot with F10 or Ctl F10. My D drive is saying it only has less than 15% space left. I don't know what to do. I think that could be why I cannot update to a new version of my antivirus. I don't know what to take off, I am a novis. I have plenty of space on C drive and plenty of DVDs. Help! I don't understand why I've run out of space if D is programs only not data. Here is my question. How many times can a hard drive be partitioned? I direct answer will be appropriate, thank you. As many times as you like. Partitions are nothing more than data on the disk. Partitioning is an anachronism from when hard-disk size was more than DOS could address and the only way to use any hard-disk over 30Gb was with partitioning. There are only two valid reason for partitions: 1)Hosting more than one O/S where each O/S needs its own Boot Partition, and, 2)A Recovery Partition. I have a netbook which came with three partitions: a hidden partition of 10 GB named "Recovery", C - Windows XP,69 GB, and D - TempPart.01, 70 GB. Later I added some Linux partitions. Recently Windows crashed; running various system restore from earlier dates did not work; the "recovery solution" on drive C could not be found, nor could various programmes in the C programmes directory, including Firefox. So I could not access the Internet. Nor did the netbook have an ODD. I tried hooking it up to an external hard disk, to which I had backed up the netbook, and tried running the "recovery solution" from there, but it seemingly had the same problem of not being able to access files on C.
At this point I was reduced to sending the Netbook to the local agent of the manufacturer. I assumed he would be able to access the presumably undamaged recovery partition, and restore the C drive to its former state. But no. He took the easy way out, and simply reformatted the entire hard disk, installing XP afresh (in German, though the original had been in English),adding the usual manufacturer crapware, and deleting all the programmes I had added, as well as the Linux partitions and programmes. When I got the machine back and protested, the technician pointed out the small print stated that all data might be lost in the course of the "repair" and the company accepted no liability. So I ask you, Leo, what is the point of the 10 MB recovery partition if I cannot use it, and the manufacturer's service simply deletes everything? Can I indeed access it and do my own recovery? if I run my external disk (Seagate) backup program, I do not subsequently find this recovery partition on the external drive. So how do I back it up and verify it? I would be grateful, therefore, if you can suggest what a netbook user should do. 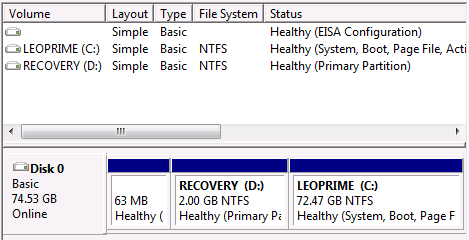 The recovery partition is manufacturer specific so there's no consensus on how to use it or what exactly it contains. Personally I remove it and free up the space to be used on the C: drive - I much prefer to rely on full backups I control. I have just got a 1Tb portable drive and was wondering what to do about partioning and formatting. Thanks to your article(s) I now know that I don't have to have to worry about doing anything . I believe I could do everything , using your articles , should it be needed. Thank you again for your help and timely response. think I am going to leave the partitioning alone even though I only have 4 gig left on C drive.